ED 2000 Anti-Fouling System consists of an electronic control unit, a pre-wrapped solenoid sheet and a "clam-shell" ABS plastic enclosure. 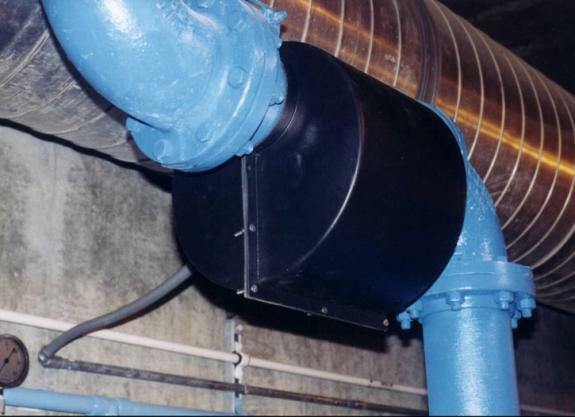 The clamshell enclosure is fitted over the condenser supply (and return) pipe in either a vertical or horizontal position prior to the chiller. The pre-wrapped solenoid sheet inside the enclosure is made of a single-stranded 14-gauge wire. The control box is a NEMA 12 rated enclosure. The best place to install the ED 2000 coil is within 50 feet of pipe length prior to the chiller or heat exchanger that is to be treated. This distance can include valves, 90° elbows or 180° turns. One coil is mounted on the condenser or heat exchanger supply line. 1. Mount the control box within 50 feet from where the coils will be placed. 2. 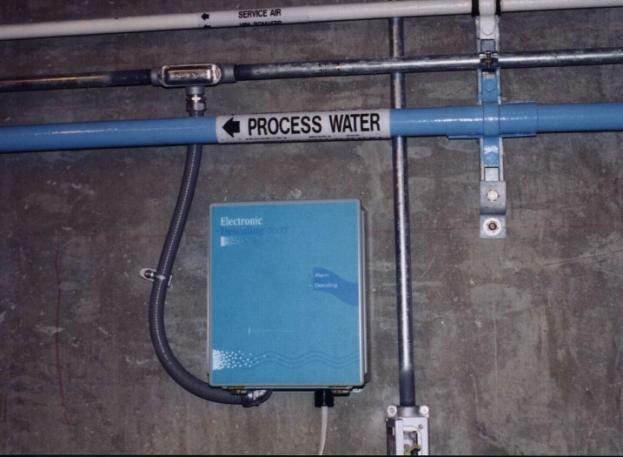 The power supply should be run inside conduit. The low voltage cable can also be run inside conduit, depending on local electrical codes. Please have a licensed electrician direct wire the power supply. 3. Connect the power of the ED 2000 Anti-Fouling unit to a power source outlet (110V AC, 50-60Hz, 1.5 Amps). Do not reverse the polarity of the power cable as this may damage the unit. Power may continuously run. It is not required to turn off the system at any time. Power consumption is approximately 150 watts. 4. Open up the clamshell enclosure (the pre-wrapped coil is already fitted inside) and fit it around the pipe. Do not permanently close the enclosure until the wiring is complete. 5. Run the wire from the control box to the clamshell enclosure. If additional distance is required, please contact the factory, as it is not suggested to place the coil more than fifty feet from the control box. The shorter the distance between the control unit and the coils, the better. Please remove any excess cable. 6. Connect the second coil in parallel. The two coils may be connected inside the clamshell enclosures or you may use a separate electrical junction or utility box mounted externally on or near the clamshell enclosure. The control box is designed to accept only one set of wiring therefore when two or three clamshell enclosures are used an electrical junction/utility box is required. 7. Make sure the green light is on. The red, ALARM light indicates that there is an open circuit - a break in the flow of current. If a red light is on, check the coil connections. 8. Testing: A test may be performed to insure the unit is operating under optimal conditions. Measure the amperage of the coil connections with a multi-meter. Output voltage may not be measured because it is a switching circuitry. A measure of amperage and frequency should indicate approximately 4.5 Amps and 0.450 kHz with the multi-meter connected in series. (AC setting because of square wave current). The power is converted from 110 VAC, 1.5 Amps to 24VDC, 6 Amps. The unit is tested at the factory so this step is not mandatory. 9. If you have any questions regarding this installation, please contact support at (888) 474-2933 or info@ed2000.net.